As a single parent my days are long, jam-packed and sometimes flat out exhausting. Certain days of the week have a lighter schedule than others but for the most part we are always on the go. 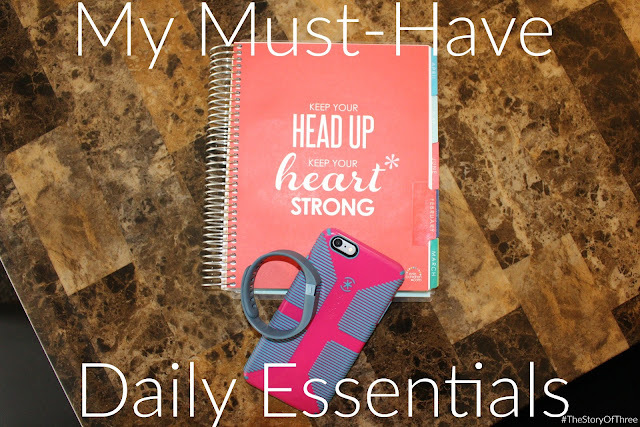 There are three things I must-have every single day to help keep me organized and my head on straight! 1. FitBit - I love my FitBit Charge, seriously! I wear it on a daily basis and every other night (the other nights I leave it on the charger), it helps keep me motivated on reaching my daily 15,000 step goal. Since we moved I've been seriously slacking, I haven't been walking on a daily basis and it's killing me. I'm still hitting my daily goal most of the time because I'm on my feet all day for work, therapy, chasing the kids, etc. I am hoping this week (weather permitting) to start daily walking again and getting more steps in, it's important that I get daily exercise. I also notice when I walk (30 minutes to an hour) on a regular basis, I sleep better and my joints don't hurt (specifically my knees). Eventually I'd like to start jogging or running again, (that's a story for another day) but one thing at a time. A FitBit is great to have whether your tracking daily exercise, food/calorie intake or your sleep schedule. It's made a huge difference in my life and I highly recommend getting one! 2. Erin Condren Planner - How did I even stay organized before this entered my life? This is my first Erin Condren planner, I am kicking myself for not buying one sooner! My feet hit the floor at 5:30 am and I typically don't crawl into bed until about 10pm (sometimes later), so I rely on this beauty every single day. This planner is a life saver, it holds so much more than just my day to day schedule, plus it's bright, colorful and fits in my purse perfectly! By the way - that is February's cover, and it's perfect for this month! It's like it was created just for me - keep your head up, keep your heart strong! 3. iPhone - Oh my iPhone, it's what keeps me connected. I remember growing up we only had one phone in the house and it was connected to the wall, my kids will never know the real struggle of making a phone call. Siri helps me keep the kids entertained, (just ask her "what does a fox say"), I have all of my favorite apps on hand (Facebook, Instagram, etc) and of course I can keep up with all my friends and family via text or phone call. Both of my children can work my phone probably better than me, and Little Sister C takes way too many selfies with it, and Big Brother C prefers for the Netflix app to be on the first screen for easy access. I keep my phone on me at all times, if it's not in my hands, it's in my pocket or the cup holder of my truck when driving. Sorry Android users I just could never make the switch, I'll be an iPhone user for life - it's just meant to be. What are your must-have daily essentials? I should really look into getting a planner. Thanks!